It was an emotional day on Ocean B ward at Queen’s Hospital today (30 June), when a couple who have been together for over two decades married just days after receiving a terminal cancer diagnosis. Read " Devoted couple marry in hospital followi…"
Over 200 people attended our nursing and midwifery recruitment event – with 50 people bagging a job on the day. Read " Our nurse and midwife recruitment day pr…"
We’re supporting the national Breastfeeding Celebration Week from Monday (26 June). Read " Advice for mums during national Breastfe…"
Our improvements have been cited in a report by the Care Quality Commission (CQC). Read " We’ve been praised by the CQC…"
Graeme Aitken, our speciality matron for surgery, organised a fundraiser after it hit home how much his wards needed a space to speak to patients and their families privately. Read " Charity golf day raises over £5,000…"
We would like to encourage members of the public and our partners across Barking, Havering and Redbridge to come along to our Annual General Meeting on Wednesday 5 July to hear about the key developments in our hospitals over the past year. Read " Come along to our AGM!…"
We held a special coffee morning to mark the end of Volunteers’ Week and thank our dedicated volunteers for their hard work. Read " Thanks to our volunteers for their dedic…"
A charity gold day is taking place on Friday (16 June), which will raise funds for the King George and Queen’s Hospitals Charity. Read " Have a craic and help our hospitals at c…"
Nurses and midwives could bag a job on the spot at our recruitment event! We’re hosting a nursing recruitment day on Saturday 17 June – where nurses and midwives could bag a job on the spot! 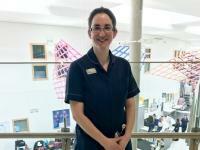 Read " Nurses and midwives could bag a job on t…"